Electrical power can be transmitted using overhead and underground transmission lines. While both lines have their pros and cons the ultimate choice depends on environmental and technical geography and applications. 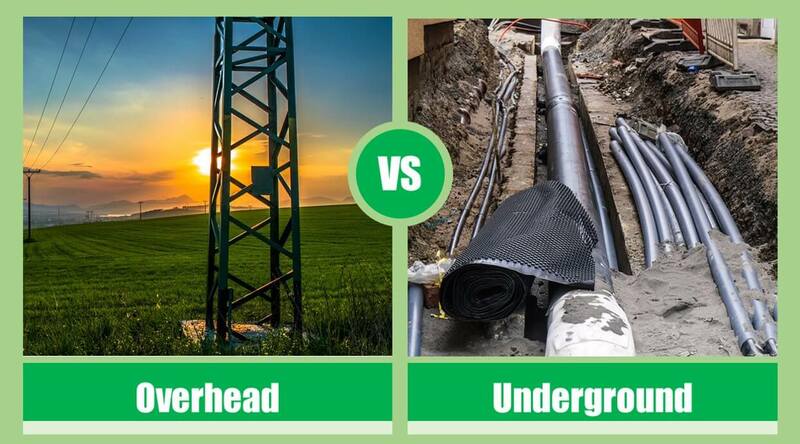 Given below are top 10 differences between overhead and underground transmission lines. Overhead transmission lines are the bare conductors that are supported on pylons. Transmission lines poles are installed at a certain distance to hang these conductors above in the air. Underground lines are the insulated cables that are buried under the earth. Underground vaults, cables, and trenches are installed. Underground transmission lines are 5 to 10 times more expensive than overhead transmission lines. Underground lines require special cruises for digging trenches. Furthermore, vaults should be installed after every 1200 feet where lines are connected together. Low voltage distribution lines cost somewhat less but HVUG transmission lines are very expensive. The lifespan of Underground transmission lines (UG) is half than an overhead line (OH). Generally, UG lines last for 35 years, whereas OH lines work fine for up to 70 years. OH conductors hang in the air at a certain distance, the required insulation is provided via air and no other insulation is required. In case of an underground line, the conductor should have a proper thickness of insulation to ensure a high degree of safety. OH lines are exposed to thunders and natural lighting, whereas overhead lines are buried deep under the earth and there is no danger of lightning. The frequency of outages on UG lines is half than that of OH lines. The outage frequency on UG lines is half than that of OH lines, but once an outage occurs it takes a couple of day to weeks and even months in finding, and repairing the problem. UG transmission lines should be used in cities and congested areas while OH lines are more practical in open areas. Modification and upgradation of OH lines is an easy task while replacing UG lines is a tedious task. Underground lines are generally recommended for LV levels (usually below 66 kV) while OH lines are feasible for all levels.